With the advancements in dental implant materials and techniques in the recent years, dental implants have become an integral part of any treatment plan from single tooth to full mouth restorations. With an overall success rate of about 95% and almost 50 years of clinical research, dental implants are frequently the best treatment option for replacing missing teeth. No filing down teeth, dental implants do not require reducing or altering the teeth next to them like it is done for bridges. Permanence, implants will last for many years , but they require the same maintenance as real teeth, such as brushing, flossing, and regular visits at the dentist. With proper care, implants can last a lifetime. 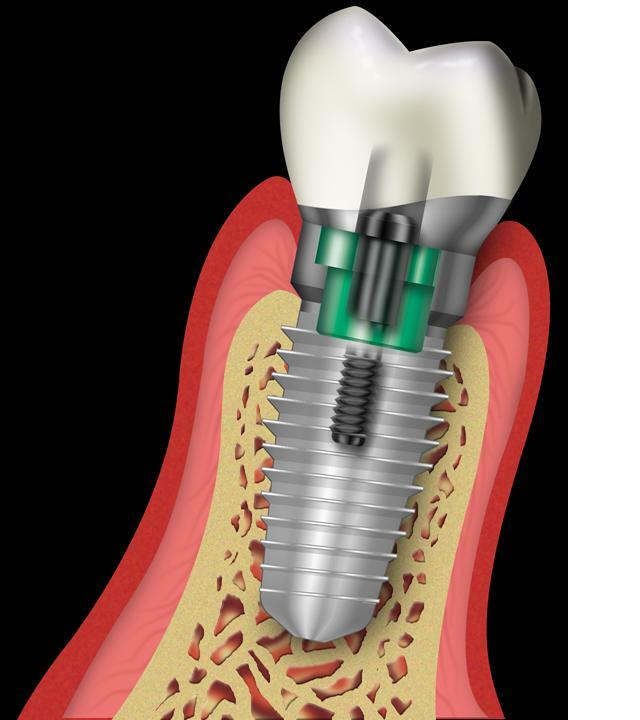 Implants are tiny titanium posts which are inserted into the jawbone where teeth are missing. These metal anchors act as tooth-root substitutes. The bone bonds with the titanium, creating a strong foundation for replacement teeth. Small posts are then attached to the implant which protrude through the gums. These posts provide stable anchors for replacement teeth. For most patients, the placement of dental implants involves two surgical procedures. First, implants are placed within your jawbone. For six to sixteen weeks following placement, the implants beneath the surface of the gums gradually bond with the jawbone as bone actually grows around the treads of the titanium implant. You should be able to wear temporary dentures and eat a soft diet during this time. At the same time, your dentist is forming new replacement teeth. After the implant has bonded to the jawbone, the second phase begins. The Doctor will uncover the implants and attach small posts which will act as anchors for the replacement teeth. These posts protrude through the gums. When the artificial teeth are placed, these posts will not be seen. The entire process of implant tooth replacement can take 8 weeks to 6 months depending on the type of case. Most patients experience minimal disruption of their daily life. Your surgeon will review the time required for treatment at the time of your consultation.